This page is here for legacy purposes. It is most likely mis-spelled and messy. Enjoy. 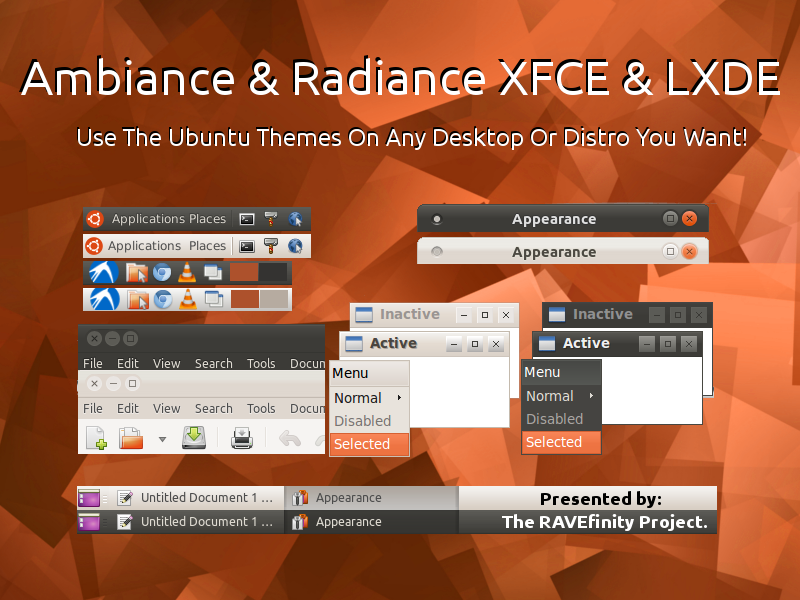 Is a refined and tested port of Ambiance/Radiance themes for the XFCE & LXDE desktops. Now you can easily have the "unified experience" of Ambiance & Radiance themes on the Xfce,LXDE and Openbox desktops. Attention Users! As of September 2015, This theme is now officially discontinued! We no longer have time to update it. But do not fret! You can use a very similar or better theme we develop called Ambiance & Radiance Colors! Just be sure to select Ambiance-Color-XFCE-LXDE Or Radiance-XFCE-LXDE In your theme pane. Ambiance is the darker flavor. Dark panel, menu etc. Radiance is the lighter flavor. Light panel, menu etc. We also make a color version of Ambiance & Radiance in 13 New Colors that supports XFCE and LXDE fully, as well, Check it out... When Installed Just be sure to select Ambiance-ColorName-XFCE From your Theme manager. And Paste These Lines 1 By 1, Pressing Enter After Each. Ubuntu 15.04 , Linux Mint Debian 2, Debian 8 And Other Distros. 14.04 & 14.10 Users Please Download 14.04.8 bellow this build (Further down the page). The 15.04 build is not backwards compilable. This Build is for Ubuntu 15.04, Debian 8 Users & Distros w/GTK 3.14 ONLY. 14.04 & 14.10 & GTK 3.10-12 users please use the 14x specificbuild further down the page. 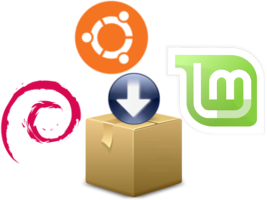 Ubuntu 14.04 LTS, 14.10, Linux Mint 17 LTS And Other Distros.